South side of Church at Langford. A decorative panel interrupts the pilaster on the south face. 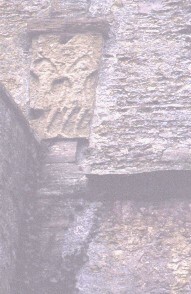 This panel shows two kilted human figures holding up a semi-circular sundial. These is now very weathered and difficult to see. Taylor, H.M., Taylor, J., Anglo-Saxon Architecture 1st, Cambridge University Press, Cambridge. (1965) Crosses, Sculpture, Anglo-Saxons, England..